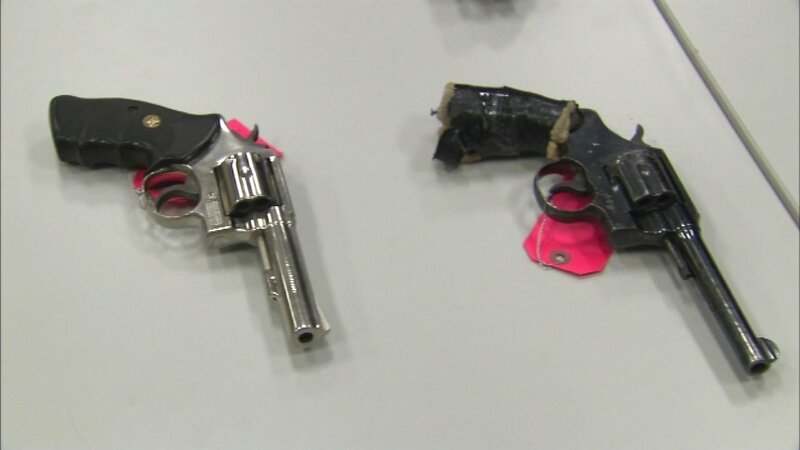 CHICAGO (WLS) -- The city of Chicago released Sunday a report highlighting how guns are used in crimes across the city and where they are coming from. The 2017 Gun Trace Report found that 60 percent of the guns used in Chicago's crimes have come from out of state. The report also suggests that many guns were sold from suburban sporting goods stores with just ten dealers selling almost a quarter of guns recovered from crimes in Chicago. The report says Chuck's Gun Shop in Riverdale, Ill. and Midwest Sporting Goods in Lyons, Ill. are the top two source dealers of traced crime guns in Chicago. The remaining stores in the top ten are: Westforth Sports in Gary, Indiana, Cabela's in Hammond, Indiana, Shore Galleries in Lincolnwood, Illinois, GAT Guns in East Dundee, Illinois, Suburban Sporting Goods in Melrose Park, Illinois, Pelcher's Shooter Supply in Lansing, Illinois, Blythe's Sport Shop in Griffith, Indiana, and Sporting Arms and Supply in Posen, Illinois. "Children, families and all residents in every neighborhood of Chicago deserve to live free from violence and safe to pursue their dreams," said Mayor Emanuel. "The Gun Trace Report once again shows that illegal guns, purchased outside of the city of Chicago and trafficked through an illegal and unregulated market, have a profound impact on the lives of Chicagoans. We must work to expand the City's model of regulations to stop this flow of illegal guns at the source statewide." For each year from 2013 to 2016, the report says Chicago police have recovered more firearms than Los Angeles and New York City without adjusting for population, with just below 7,000 illegal guns per year. Policy recommendations in the report include the Illinois Gun Dealer Licensing Bill which aims to provide oversight to gun dealers to deter straw purchasers and also help law enforcement track guns, the report says. "While we have made significant progress to reduce gun violence this year, the historical challenges we have seen in some of our communities on the south and west sides is directly affected by the availability of illegal guns that come into Chicago," said Chicago Police Superintendent Eddie Johnson. "The data in this report shows the urgent need to pass the Gun Dealer Licensing Bill that will address straw purchasing and lax background checks that occur in Illinois. I believe it will go a long way to help to stymie the flow of these weapons onto our streets." The report is a result of a collaboration between Mayor Emanuel's office, the Chicago Police Department and the University of Chicago Crime Lab. The report analyzed data from thousands of gun crimes from 2013 to 2016.